People's behaviors synchronize. It is difficult, however, to determine whether synchronized behaviors occur in a mutual direction-two individuals influencing one another-or in one direction-one individual leading the other, and what the underlying mechanism for synchronization is. To answer these questions, we hypothesized a non-leader-follower postural sway synchronization, caused by a reciprocal visuo-postural feedback system operating on pairs of individuals, and tested that hypothesis both experimentally and via simulation. In the behavioral experiment, 22 participant pairs stood face to face either 20 or 70 cm away from each other wearing glasses with or without vision blocking lenses. The existence and direction of visual information exchanged between pairs of participants were systematically manipulated. The time series data for the postural sway of these pairs were recorded and analyzed with cross correlation and causality. Results of cross correlation showed that postural sway of paired participants was synchronized, with a shorter time lag when participant pairs could see one another's head motion than when one of the participants was blindfolded. In addition, there was less of a time lag in the observed synchronization when the distance between participant pairs was smaller. As for the causality analysis, noise contribution ratio (NCR), the measure of influence using a multivariate autoregressive model, was also computed to identify the degree to which one's postural sway is explained by that of the other's and how visual information (sighted vs. blindfolded) interacts with paired participants' postural sway. 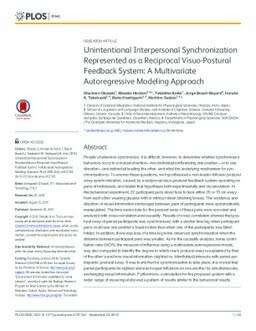 It was found that for synchronization to take place, it is crucial that paired participants be sighted and exert equal influence on one another by simultaneously exchanging visual information. Furthermore, a simulation for the proposed system with a wider range of visual input showed a pattern of results similar to the behavioral results.